Product rankings provided come from the 2018 Pharmacy Times Survey of Pharmacists’ OTC Recommendations, which is an annual event polling nearly 2700 U.S. Pharmacists. Detailed product information comes primarily from the National Library of Medicine (NLM), using their database of over-the-counter (OTC) product labels. Please note that not all product label information is available, including vitamins, dietary supplements, homeopathic products, and durable medical goods. We are adding additional product information regularly, but if you see something missing, please let us know at info@pharmacytimes.com. Are generic products in the survey? 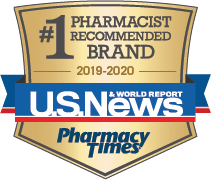 The Pharmacy Times Survey of Pharmacists’ OTC Recommendations specifically asks pharmacists just about OTC brands that represent the most recognizable products in their respective classes. While generic products can meet your needs, please consult your pharmacist about selecting one that is right for you. Where is my favorite product? The database of products in the website is limited to those that are included in the 2018 Pharmacy Times Survey of Pharmacists’ OTC Recommendations, which included more than 1100 products from 173 categories. While this covers many available products, it is not an exhaustive list. If there is something missing, let us know by sending us a note at info@pharmacytimes.com. Can I use this website to save time and avoid bothering my pharmacist? We hope the information provided in the website will save you time in learning about OTC products, however it is not a substitute for consulting with a pharmacist or other qualified health care professional. Those communications can ensure safe and appropriate product selection, including avoiding drug and disease interactions.